We are a friendly group of girls, who enjoy going out jumping, balancing, vaulting and scaling walls together; regular nights out with lots of dancing and drinking coffee also feature high on our list. 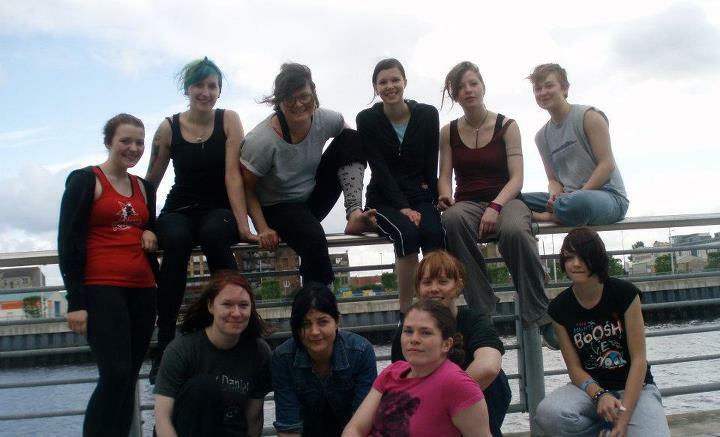 We have an all female class in Glasgow on Tuesday evenings and regular jams as well and are always looking for new female members to join the community. For more details on classes visit the Glasgow Parkour Coaching Website. And for our Facebook group click here. ‘The first name for the discipline, born in France in the 1980s, was Art du Deplacement; best translated in English as the Art of Movement. Over time other names were used to describe it, including Parkour – derived from the French parcours, meaning ‘route’ or ‘course’ – and later Freerunning. However, the name has never been as important as the methods and spirit of practise which remain at its core today. For the sake of convenience, these pages will refer to the discipline as Parkour. Parkour focuses on developing the fundamental attributes required for movement, which include balance, strength, dynamism, endurance, precision, spatial awareness and creative vision. It is a way of training one’s body and mind in order to be as completely functional, effective and liberated as possible in the physical realm, and a way of thinking based on rigorous self-discipline, autonomous action and self-will. Beyond this simple explanation, however, parkour is a discipline of self-improvement on all levels, an art that reveals to the practitioner his or her own physical and mental limits and simultaneously offers a method to surpass them.